Our very popular Phalaenopsis Orchid plant has been potted in a Tuscan earthenware container and supported with a vine heart. The pottery and vine hearts are hand-fashioned and will vary slightly from those shown. 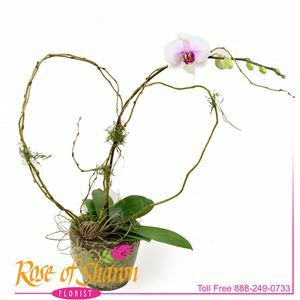 The long-living orchids are well suited to the Central Coast and make very popular gifts for Valentine's Day or any day.